Throughout the PAISAA girls' volleyball playoffs, the Notre Dame junior was the team's total kill leader, the leader in hitting percentage, was second in total digs since she played both front and back rows and was second in aces. Notre Dame head coach Mike Sheridan said, "Whenever the team needed a point throughout the season, including during the playoffs, she was our go-to attacker. She also brought great energy and spirit each match.' 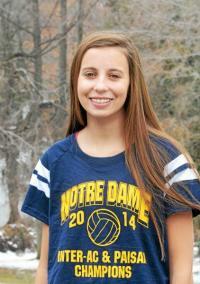 Quigley's grade-point average for the 2013/2014 school year was 3.72, enabling the Academy of Notre Dame volleyball team to be nationally recognized as an All-American Academic Volleyball team by the AVCA (American Volleyball Coaches of America), one of only six high school girls' volleyball programs in Pennsylvania to be so recognized. Read more.